the eric update – day 226: player piano! making good on her promise to send us a toy with a full diatonic scale, we received a box with a bunch of goodies from my sister, including this vtech little smart land ‘n sea jamboree. who knew that vtech made stuff other than cordless phones. it’s interesting to see how well different toys are able to hold odin’s interest and this one passed with flying colors. 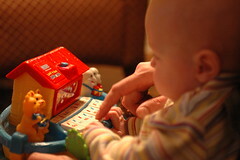 i’ll admit to failing to understand the thinking behind the smart land ‘n sea jamboree theme what with the keyboard on a boat with animals and a house, but odin seemed quite happy to play with all the objects and seemed particularly dedicated to figuring out how to rip the red roof of the house. Previous Postthe eric update – day 225: odin’s epicurean adventures! the incredible, edible egg.Next Postthe postcard project: green bay wisconsin.